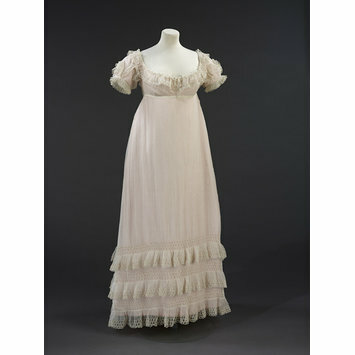 This sheer muslin evening dress demonstrates the survival of neo-classical elements of women’s dress into the early 1820s. While heavier fabrics in brighter colours appeared in day dress, white remained fashionable for evening. This particular example may well have been for summer wear. 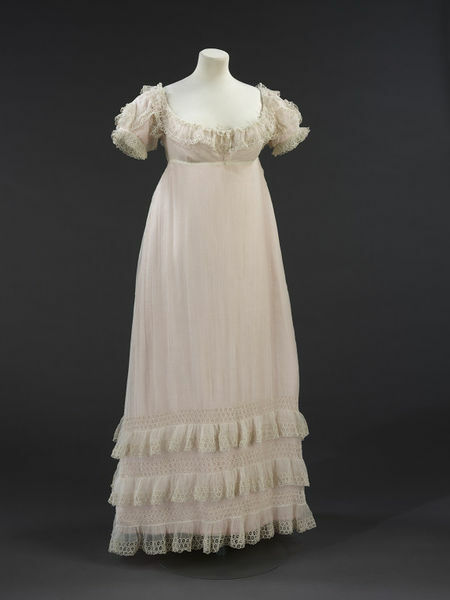 It would have been worn with an under-dress of silk, possibly in coloured fabric. The off-the-shoulder neckline and short sleeves were appropriate evening styles. By the early 1820s, skirts shortened to ankle length and decorative flounces appear at the hem. Embroidery in white, called whitework, was a popular style of decoration on white muslin. The wheel motif embroidered in buttonhole stitch, also includes a technique known as cutwork. The muslin at the centre of each wheel is cut away and the spokes worked in picot bars. A white muslin evening gown with waistline under the bust, off-the-shoulder neckline and full, short sleeves. The back fastens at neck with cotton tape and narrow silk ribbon tie on a drawstring at the raised waist. The A-line skirt is about ankle-length and trimmed with three muslin flounces edged with whitework in a cutwork 'wheel' motif in buttonhole stitch and picot bars. A flounce worked in the same way adorns the neckline and sleeves. Length: 135.7 cm overall, approx.